At the suggestion of a very good friend, who wears his dinner clothes even more often than do I, I’m going to chime in on black tie. ‘Tis the season, after all. Gentlemen, I know that you are, to a man, well-tailored and well-dressed during business hours. But after six, do you know where your choices lie? Our evening wear hasn’t changed that much in the last century or so, and your dinner suit may only require that you have the trouser legs made a bit thinner, or a pleat removed, to be au courant. Which also means that the 50’s and 60’s dinner jackets at the vintage store are a very stylish (and usually very well made) choice. Make sure that your bowtie isn’t of the huge butterfly variety and wear a turndown (soft) collar. Unless you feel like channeling Tom Ford, in which case try a velvet butterfly bowtie. Yes, the butterfly bowtie, larger lapel and extravagantly cut cummerbund are back. Yup, it’s the 70’s, as interpreted by Tom Ford. The difference? If you are over thirty, don’t do it. It will only look as if you haven’t updated a thing since your prom. Speaking of which… no fun coloured dinner jackets (unless they are plaid. Plaid gets an exception, I’m not sure why.) Save bottle green, maroon, red, purple or brown for your velvet smoking jacket which won’t be worn outside of your house. Stick with the classic black (or better yet midnight blue!) tuxedo, white pleated shirt with turndown collar, studs, cufflinks, cummerbund or vest (I prefer black or white) and braces (suspenders here in the USA.) And don’t forget your pocket square — white, purple, orange, maroon — have fun with it. Since few of use wear a flower in our buttonholes, a pocket square is a good place to add a little colour. When in doubt, white linen or silk is never wrong. There is a reason that you should stick with the tried and true when choosing your dinner clothes and accessories. All men look very good in the black and white combination and we tend not to overshadow our extravagantly begowned and coiffed dates. As for your one-button dinner jacket, or your double-breasted model, your lapels should be peaked, or you may choose a shawl collar model. Notched lapels are for business suits. If you already own a notched lapel dinner jacket, please don’t make the mistake of wearing a four-in-hand tie which will make your tuxedo look even more like a suit with an odd silk lapel. Shoes are always an issue. Opera pumps (patent leather with the grosgrain bow) are the final vestige of court dress and as such are sort of fun to wear. But they may be difficult to pull off for some of you. A good solution is the Belgian shoe. Or choose a plain toe oxford lace-up and polish them until you could use your shoes as a shaving mirror. The patent leather oxford is a nice solution, for those who like the mirror-like gloss and the ribbon laces below the ankle. Your hose (socks) may be of silk, cotton or wool. The safest bet is to wear black or midnight blue to match your trouser. Finally, a word about watches. There are two schools of thought. One: don’t wear a watch; you’re supposed to be concentrating on having fun and charming your date. Two: if you must wear a watch, you may wear an anachronistic antique pocket watch in your vest pocket, or a discreet, black leather banded, very thin, gold or silver case watch. A Cartier tank, for example, is the classic choice. Oh, and the secret to not feeling like you’re wearing a penguin suit? Good tailoring and a lot of wear. Get comfortable in it. Like our man above. 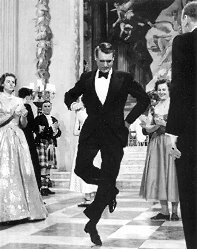 This entry was posted in Elegantology and tagged black tie, Cary Grant, dinner jacket, formal wear, Tom Ford. Bookmark the permalink. May I just add one item, a dark overcoat (gloves, scarf, etc.). At a very formal affair this past weekend, you would not believe the number of men that jumped out of their cars in just their black tie and it was snowy and cold. Great post! Hello 3PG, thanks! I tend to forget that sort of thing when it is 70ºF outside as it is now. The topcoat is extremely useful in that one’s date always winds up wearing it. I also long for coat checks… . And that shot of Cary is from one of my all-time favorite movies. Bergman and her sister-in-law do nothing but wear great clothes in that film. Alas it was 0 degrees when I woke up this am so we are all bundled up in down! (feathers, that is). Why do tartan dinner jackets get a dispensation? Because King George VI began wearing them in 1950 … and what was once consider ghastly was suddenly comme il faut! He had two made that year and wore them with black trousers at “informal parties”, according to The New York Times. And though the fashion magazine “Tailor and Cutter” frowned on such sartorial experiments, once the King donned a tartan dinner jacket, the magazine solemnly intoned “His Majesty will bring dignity to this garment”. Nicely done and to the point. I did see a pair of patent leather tassel loafers in the British GQ. I like them. Reminds me of college and post college where I had a dinner jacket but didn’t have the $ for pumps and wore black calf tassels instead. I aquired a 1944 Brooks Bros tartan dinner jacket last year on Ebay. Shawl lapel and a very light wool with grosgrain turnbacks on the sleeves. I have a feeling it will not make it out of the closet this year what with many parties being cancelled. Still, it’s nice to look at it. ELW, I watched it just the other day. Just to see how he stood in the door that first instant. Still life of extreme elegance. Aesthete, count on you! I had forgotten that gem if I ever knew it. Tintin, there is always Christmas Eve dinner! Turnback cuffs, too! Nice score. not sure about tartan jackets but I do enjoy wearing the kilt and argyll jacket to black tie dos, with ghillie brogues. Was once mistaken for a taxi driver in Solana Beach, CA while wearing the kilt, but that’s another story! Very well done. I like to add a silk evening scarf in dark paisley and I always wear a vest. I cannot carry off a cummerbund. I like very plain black lace ups too, highly polished of course. I also love my white dinner jacket in very light weight wool as befits my subtropical locale. Also, I like a red carnation in the button hole. At least it stays there and does not need fiddling with like a pocket square continually does. hip hip hooray for the penguins. I do feel that opera pumps are the only proper way to be shod when wearing a dinner jacket. I’m sad that both of my “formal” holiday parties were cancelled this year, but it’s inspired me to seek out a formal New Year’s invite to break out the tux. As an added bonus it’s a timely reminder each year to become more resolute in my work-out routine in the next year. Well stated. And while we all trust your old school style and infinite wisdom here, it’s totally wasted on me. How come? I’m always late. But no matter what – I always smell really clean. A bottle of Vetiver is parked near the front door to spritz myself with; this is particularly helpful whenever I have to fish my shirt out of the dirty clothes bin.